Devin Rieta and his fishing partners Keola Vida and Steven Arrocena, put it to the lead off Plenty Kiawe Point and settled in to wait for moonrise. At 12:40 a.m., Devin took a powerful strike on his Nitro XH pole and the 60-lb test Ande line drained rapidly from his Penn 4/0 reel. Devin gave the rampaging fish no relief and soon Steven sank the gaff. 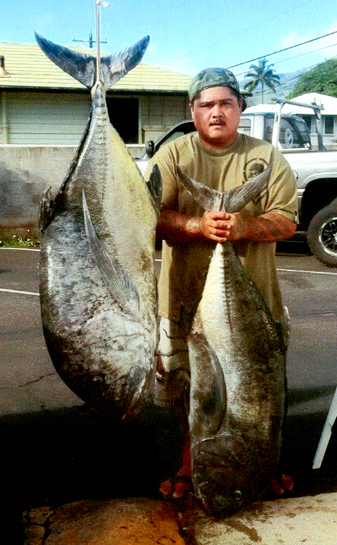 Devin weighed his fish at New Maui Fishing Supply Store. It weighed 100.02 lbs.